For some of the luckiest teachers, summer break has already started! For the rest of us, our countdown clocks are ticking and we are counting the minutes and seconds left in the school year. Before your school year ends, take this time to submit your final ClassMax reports to your district and school admin teams. Make sure you submit your final accommodations reports for your ESE/504/or other special consideration students. Run your report for the last period of time you are monitoring (weekly, quarterly, etc. ), but take it a step further and earn one more gold star before you end a stellar year by voluntarily submitting a cumulative yearly report of accommodations. You’ve collected all the data this year, so be sure your admin team knows about it! Not every student will need a year-end behavior report, but be sure to run them for your high-fliers. You can submit these to your grade-level administrator or dean. Or, save the file digitally for yourself just in case any issues come back to haunt you over the summer or next school year. I once had a parent contact my principal about a test score their student received on their final exam in my class (I graciously gave him a 50%, even though he didn’t even turn in a test paper…). Because I had kept clear and daily records of the student’s behavior and performance in my class, I simply had to pull up the year-end summary of the ClassMax notes I had kept on that student and there was my protection from any parent accusations. CYA. It’s a real thing. I don’t know about you, but I wait on pins and needles for my student scores every year from our state standardized test. I want to know if my instruction was on target or if there is something I need to change for the next year. For this reason, be sure to run a WHOLE CLASS FOR MULTIPLE CLASS PERIODS report so that you can go back and compare how your students performed. If you’re feeling really pro-active, send a copy to your assessing administrator with a little “year in review” email summary. It only takes a minute to look professional and on point when your data is easily available. With ClassMax, it is easy to take a look at how your year went. 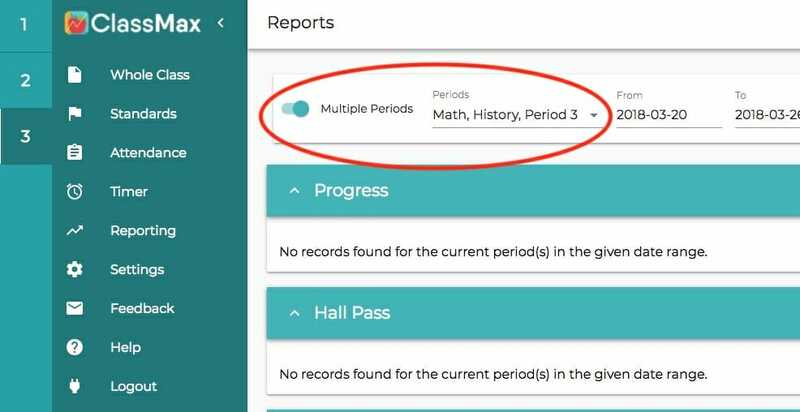 As you wrap up this school year, utilize our whole class reporting for multiple classes to keep records easily. You worked hard to collect all that data. Use it! Flaunt it! Report it! No one will impress your administrator for you, so you have to do it for yourself. Let ClassMax reports help you! This entry was posted in End of Year, Reports and tagged ClassMax, digital teacher, EdTech, education, teachers.